You know how there are some things that you just have to get at Costco? I don’t even have a membership and I still have my list. Craisins, granola bars, coconut oil, nuts, etc. I love granola bars and eat at least one a day in my packed lunch. Well I did until I looked at the ingredients of said granola bar and was shocked at how many I couldn’t pronounce. Never a good sign. 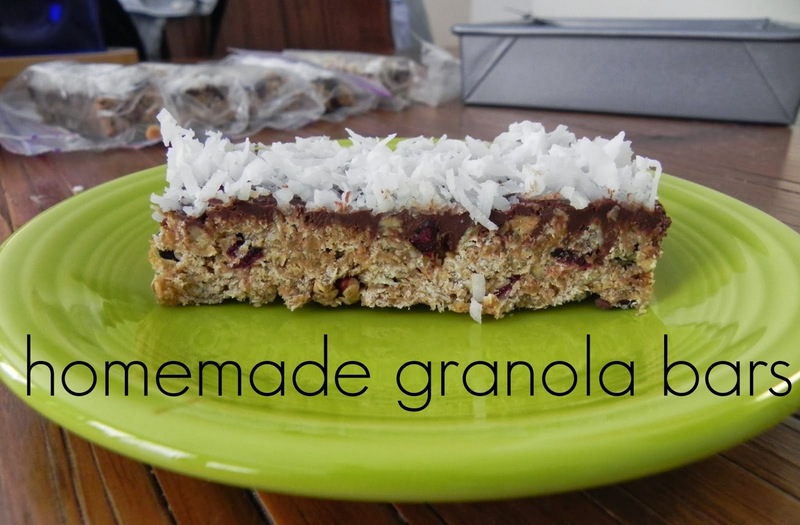 Well, as it turns out, making your own granola bars is surprisingly easy. With a little trial and tweaking I ended up with a recipe that I love. The thing I love most about this recipe is how flexible it is. Sometimes I have almonds, sometimes I buy cereal we don't like on its own and sometimes I’m out of craisins. And it still works. Especially if you, like me, always keep trail mix- type food around. Use what you have and these will turn out delicious! First combine all of your dry ingredients. For this batch I used TJ's cranberry coconut granola as my granola/ oat cereal and it was delicious. Normally we have honey bunches of oats so I'll use that. You can switch out the craisins for any other dried fruit and can substitute any kinds of nuts. I normally go for walnuts, almonds and pecans. Now use your hands to mix it all up. Once you see bubbles forming around the edge, turn the heat down and let it cook for two minutes. Remove from heat and add vanilla. Thanks to my wonderful friend Preethi who made this vanilla. Check out her blog post here. Pour the honey mixture over the dry ingredients and mix until combined. Any baking pan or tray will work for shaping and holding the bars. I like to keep my bars a little thicker so rather than finding a pan that fits I just leave some of it empty. This also makes it easier to cut and bag the finished product. Use your fingers to press the granola down to whatever thickness you prefer. If you know what's best for you, you'll top these bars with chocolate and nuts so make them a little thinner than you'd expect. Wait a few minutes before moving onto the next step so that the granola has a chance to firm up. A little bit of chocolate never hurts, right? Especially when it's dark chocolate. Melt the chocolate in the microwave for 30 seconds at a time, stirring between rounds, until the chocolate is nice and smooth. Then spread evenly over top. Add whatever toppings you have on hand. I like to do a variety of coconut, nuts and classic chocolate. Refrigerate for an hour or so before cutting to allow the chocolate to dry and toppings to set in the chocolate. Cut into desired shape and size. Store in an airtight container. I use sandwich bags, which makes packing lunch nice and easy! Combine oats, cereal, craisins and nuts in a large mixing bowl and set aside. Over medium high heat, melt butter. Add brown sugar, honey and syrup. Stir until combined. Heat until mixture begins to bubble along the edges. Reduce heat to medium and cook for 2 minutes. Pour the honey mixture over the dry ingredients and mix well. Pour granola into a buttered cake pan/tray and use your hands to shape it. Form it into desired height. Let sit for 3-5 minutes. Melt chocolate chips in the microwave (or a double boiler) until smooth. Pour over the granola and spread with a spoon. Then top with shredded coconut or mixed nuts. Cut granola bars into desired sizes and store in plastic bags in the fridge. Makes 10-14 bars. Yay! These look amazing! I am totally going to try these. Thanks for sharing!! !